What Happens After Hamas Wins? Will Israel and Hamas Renew Their Gaza Truce? Israel's strike on Gaza had been expected for days, but it was still a surprise when it finally came. Taking advantage of good weather, which is forecast to last at least three days, Israeli planes bombed some 40 Palestinian police stations, posts and other targets early Saturday morning, killing more than 150 people, including a number of senior Hamas military leaders. The first strikes came in a coordinated three-minute blitz. Israeli officials say the strikes were necessary to force an end to the rocket attacks from Gaza, which has been ruled by the radical Islamist group Hamas since it split from the Palestinian Authority, run by President Mahmoud Abbas out of the West Bank. Palestinian militants in Gaza have long launched Qassam and other rockets at Israeli towns across the border, and in the past six weeks the number of attacks has increased dramatically. After the attack, Israeli officials said the number of Palestinian rocket attacks could now spike to 200 a day. Hamas announced that it had sent a rocket toward Askelon; one man in the Israeli town of Netivot, east of the Gaza Strip, was killed. Israel also expects Hamas to launch suicide attacks against Israel; a Hamas leader promised as much on Saturday. 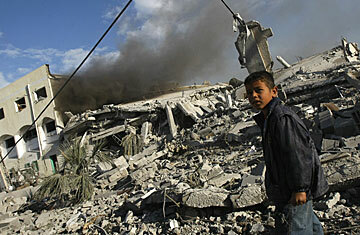 But Israel is prepared to ratchet up the pressure still further in the hopes that it will force a workable cease-fire. Saturday's attack was authorized two days in advance, and though no Israeli ground troops have crossed into Gaza thus far, that remains an option, according to Israeli officials. Dozens of Israeli air force planes remain in the skies above Gaza. "If they retaliate, they will feel it stronger, and the number [of casualties] on the Gaza side will rise," a senior Israeli military source told TIME. Israel and Hamas agreed to a cease-fire in June. Israel wants the release of captured Israeli soldier Gilad Shalit, and is extremely wary of becoming embroiled in a military operation in Gaza with no clear exit strategy. Hamas needed the truce to relieve the catastrophic economic strain on Palestinians imposed by the Israeli siege and to consolidate its control over Gaza. And so, for very different reasons, the two sides found themselves negotiating  not directly, because neither side recognizes the other  but through an Egyptian mediator. But in the past few weeks, the cease-fire has all but broken down. Indeed, even as the Israelis said the operation was continuing, Egypt was among the diplomatic casualties. Cairo played host to Israeli Foreign Minister Tzipi Livni on Dec. 25. She took the opportunity to criticize Hamas for its rocket attacks. The silence of her Egyptian hosts is now being seen by Palestinians as indirect collusion with Israel, damaging Cairo's ability to play mediator. Furthermore, in the contest for primacy between Hamas and the Palestinian Authority, Hamas  as the "victim" of this episode  emerges as the victor in the eyes of Arabs and Palestinians. Already, elements of Abbas' Fatah Party, the bulwark of the Palestinian Authority, are campaigning against the security cooperation with Israel and talking about boycotting meetings with the Jewish state. Both Israel and Hamas have their reasons for a return to open hostilities. Livni and her allies face a looming election against the more hawkish former Prime Minister Benjamin Netanyahu. Hamas may be pushing for tactical gains, like doing away with a 656-yard (600 m) no-man's-land established by the Israeli military on the Palestinian side of the boundary fence. The recent rocket attacks were also well timed because of the political vacuum in the U.S. In Washington, officials have been urging Israel to refrain from an invasion or other operations in Gaza during the White House's transition. The air attack on Gaza has shattered that hope.